There’s an art to writing a thank-you letter. It goes beyond saying, “Thanks for _____. I really appreciate it.” We’ll show you some thank-you letter examples and templates that will help you express your gratitude in style. We’ve all seen the movie and television trope where one character realizes that another has helped them and has a profound realization. The helped person usually says, with feeling, “Thank you. I don’t say it often enough.” But you don’t have to wait for that wind-beneath-my-wings moment to show your appreciation for someone. In fact, you don’t need an epiphany at all, just some common courtesy and the desire to make a good impression. Thank-you letters aren’t just for that all-important job interview follow-up. Although it’s essential to send a thank-you after an interview, there are plenty of other reasons to send thanks. You might consider thanking people who’ve helped you with a job search, for instance, or someone you met at an event who hooked you up with networking leads. Why not formally thank a colleague who filled in for you while you were on vacation, or your supervisor, who went out of her way to help you get time off on short notice? And don’t forget to send a thank-you note to Grandma. She worked hard on that crocheted blanket! And she probably remembers a time when thank-you cards were required etiquette for such gifts. 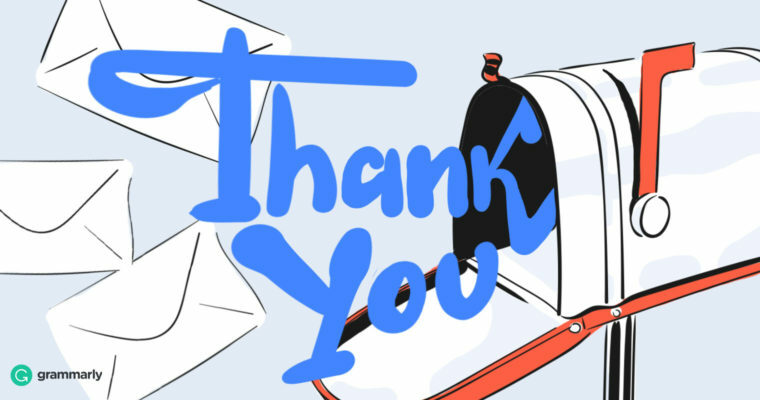 You don’t need an excuse to send a thank-you letter—just a reason to be grateful. Here are a few different situations where sending a thank-you is good form, along with some templates to help you write the perfect expression of appreciation. You did it! You wrapped up an awesome interview for a job you’re eager to land. Now that you’ve made a first impression, it’s time to send a thank-you note so that you’ll make a lasting one. Don’t forget to use your thank-you letter as an opportunity to highlight why you’re the best candidate. Just keep it subtle. Remember, your goal is to express gratitude, not make a full-on sales pitch. Here’s a tip: Consider the company culture when you decide on the format for your thank-you letter. A structured, formal office like a law firm would be most impressed by a handwritten thank-you note. A Silicon Valley tech startup might see you as a trendsetter if you sent a quick thank-you video as an email attachment. For most situations, an email to the interviewer is a foolproof option, especially if you know the company plans to make a quick hiring decision. Your thank-you doesn’t need to be formal. In fact, it should be sincere and personable. The goal is to thank the interviewer for his time and reiterate your interest in the position. We covered it in detail in our article How to Write a Thank-You Email After an Interview, According to Experts. Thank you for taking the time to meet with me yesterday to chat about the content marketing manager position at Really Big Corporation. It was a pleasure connecting with you and hearing how energized you are about the company’s content marketing and growth goals. Because of my background in influencer marketing, I was particularly interested in your innovative ideas for influencer outreach—they sparked some ideas of my own and left me with the sense that we’d make an excellent collaborative team. You mentioned that you’ll be taking some time to make a hiring decision, so I’ll do my best to wait patiently despite how excited I am to be considered. Meanwhile, let me know if there’s any further info I can provide. Thanks again for choosing me. Is formally thanking a colleague who goes above and beyond required by office decorum? Not really. And yet, it’s a professional gesture that won’t go unnoticed. If you’ve ever felt unappreciated after helping a coworker succeed, especially if you were the unsung hero, then you already understand why a thank-you note for a colleague is a powerful tool for cementing working relationships. Thank you for helping me put the final touches on the launch announcement video. You gave up some of your weekend to make it happen, and I just want you to know how much I appreciate your creative talents and energy. Your contributions made a difference, and we not only hit our deadline but created something awesome. Thanks again. We crushed it! Sometimes, we forget to thank the people closest to us for the things they do or give to us. When a heartfelt face-to-face thank-you isn’t possible, a brief letter, card, or email is an excellent way to show that your friends’ and family members’ contributions haven’t gone unnoticed. Thank you for your help with the family reunion—you’re my hero! The time you put into booking the hall and sending out invitations to family members, not to mention organizing the potluck, took much of the strain off me this year. I learned that, when I have someone to help me, the Nolan family reunion is not only manageable but fun. If you hadn’t jumped in to save the day, I might have ended up canceling it altogether and missing the chance to reconnect with everyone. I’d love to take you out for coffee next time you’re in town as a small token of gratitude for all you’ve done. Give me a call!